Born in Chicago in 1920, Dempsey J. Travis became a self-made millionaire, one of the country’s most successful black entrepreneurs. He was president and CEO of Travis Realty Co., but his many interests and his intense commitment to the community took him to board positions in the Chicago Historical Society, the Museum of Broadcast Communications, the New Regal Theater Foundation, and Northwestern Memorial Hospital. He was on the governing committee of the Film Center of the School of the Art Institute of Chicago, and was president of the Society of Midland Authors. He authored seven books, one of which helped introduce me to jazz. I put an excerpt of his autobiography, I Refuse to Learn to Fail, in my book Black Writing from Chicago. His book combines a nostalgic naiveté with an unflinching look at social obstacles as it swings back and forth between Travis’ absolute faith in the promise of success and the difficulty of fulfilling that promise in the face of racism. The book begins with his first hard experience of racism at age five and his mother’s tender response: she pulls out a beautiful black velvet jacket and says he is her beautiful black velvet boy. This sows in him the resolve never to fail. Much later, after experiencing such things as the brutal racism of the army, he gains his first major position as head of the Dearborn Real Estate Board. “At last,” he says, “I had gained the attention of both the white and Black press in Chicago.” Yet he soon realizes that “Prominence in the Black community and professional standing provided no immunity from discrimination by the insurance industry.” His response? Launch a multi-level campaign against red-lining. Travis himself, who died in 2009, would have quibbled with the term “self-made.” Undergirding his autobiography is, as Harvette Grey says in her introduction, “the conviction that African American communities can be strong…that African American heritage supersedes other issues, such as class.” Chapter 5 begins: “DuSable High School nurtured many talents, including Mayor Harold Washington, Judge William Cousins, Dr. Allen Wright, Dr. Alice Blair and comic Redd Foxx, whose real name was John Elroy Sanford. Nat ‘King’ Cole was in my Spanish class.” Travis was extraordinarily proud of this heritage of success, and thus self-making was always tied to pride in, and commitment to, the Black community. “Some of the most powerful and successful of today’s African Americans were yesterday’s urchins. 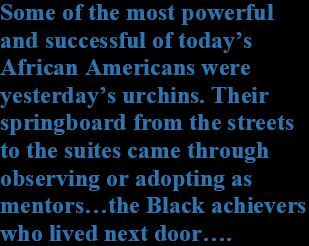 Their springboard from the streets to the suites came through observing or adopting as mentors, even vicariously, the Black achievers who lived next door, down the block, across the street or around the corner. Although restrictive housing covenants, rather than individual preferences, defined where African Americans could live until 1948, the mobility of successful Blacks during the past three decades has created a void in leadership for those who stay in the old neighborhoods. There are few role models left to meet urban youth on the streets of their own communities and encourage them to stay in school and study hard so that they, too, can achieve financial security through legitimate avenues. Role models in the 1990s spring not from the neighborhood, but from TV and movie screens. Young people watching In Living Color see Willie, the coke dealer, looking cool as he drives a Jeep Grand Wagoneer around the school. They identify with Baby Wimp the Pimp, who rides through the streets in his Mercedes Benz 560 SEL to monitor his girls. Who among their elders point out that the real role model on that TV show is Keenen Ivory Wayans, whose comedic talents and fiscal savvy are founded in self-discipline, determination and dedication? √ Go to a list of Black Writers written about on this site, OR the Teaching Diversity main page. This entry was posted in Black Writers, Chicago Writing, Diversity & Multiculturalism and tagged Black community, Black role-modeling, Black Writing from Chicago, Chicago Writing, Dempsey J. Travis, DuSable High School, I Refuse to Learn to Fail, overcoming racism, Teaching Diversity, Travis Realty Co.. Bookmark the permalink.